Sombai, Siem Reap, Siem Reap Province. Information, Photos and Reviews. 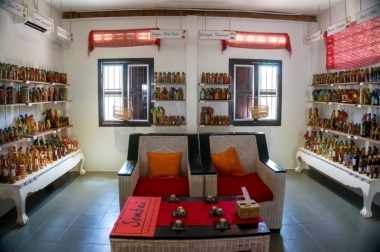 Come discover Sombai, the local liqueur of Siem Reap in a typical Khmer house. See how it is prepared in a specially designed workshop, then sits for two months in the infusion room before being bottled. Learn about the story behind the fusion between the local tradition of infusing rice wine for medicinal purpose in Cambodia and the recipes of infused rum from Mauritius. 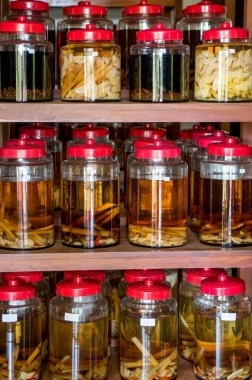 You will get to see more than a hundred glass jars full of local fruits, such as mango, banana, coconut, pineapple, lemon, tamarind and orange, herbs such as lemongrass and green tea, spices including anise seed, cinnamon, ginger, galangal and chili, all soaking in the alcohol until the infusion is completed. 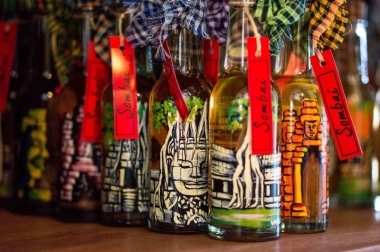 Admire the unique designs hand-painted on the bottles by young Cambodian artists. Enjoy the tantalising journey through the 11 flavours nibbling on local snacks in a homey and comfortable tasting lounge. Find out souvenirs that are not "same, same" but really different. Namaste Spa Siem Reap (1.0 miles) - Providing Massages, Henna tatoo, Scrub, Waxing, facial Massage and hair treatments etc. Nobody has reviewed Sombai yet, Be the first. You are submitting a booking enquiry. Sombai will then contact you by email with details of availability and prices.